Your auditions are all called "R18_S54_S21_T1"
Unfortunately I don't know of an easy workflow for finding and finalising all the auditions in a project. You can look in the timeline index for clips with the audition symbol (visible in the previously attached "2Auditionsincompoundclip.png") but this list doesn't show the clips that are used in compound clips unless you have specifically opened the compound clip in the timeline. The best way I can see is to look at clips around the timecode mentioned by X2Pro. If there are compound clips around that time, then check inside those too. Can you tell me the names of the clips? Is there any way to do some kind of overall render of these audition clips? Is there any indication I can see in Final Cut which clips these are. I see that an audition clip has a special symbol but is this not indicated when it is part of a compound clip? This is reminiscence of the old Final Cut in that disabled clips would cause output errors but there was an easy way for us to see those and deal with them. What is the workflow for mitigating these issues? nruyle wrote: So I've finally got a working export on XLM output #37 by deleting that last audio file. What an ordeal. Im still really curious about that audition clip issue. I still have that section of the timeline that would not export. So I've finally got a working export on XLM output #37 by deleting that last audio file. What an ordeal. Im still really curious about that audition clip issue. I still have that section of the timeline that would not export. nruyle wrote: It's give me an error on reimport also. I'm not familiar with the XML implementation with FCx. Im currently on 10.1.4. Is this some kind of bug in Final Cut. 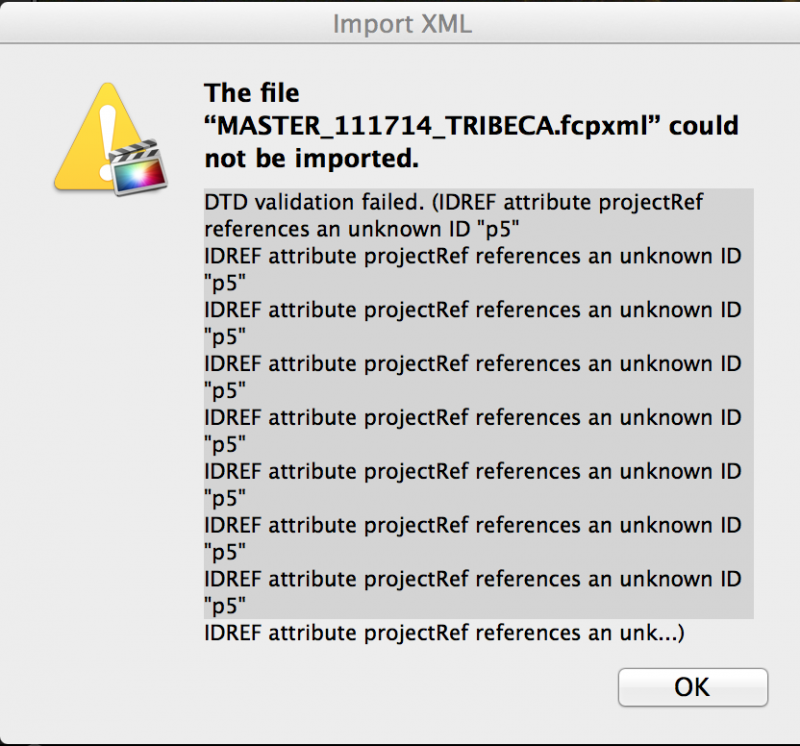 It looks like it could be; FCP X should be able to re-import it's own XMLs, but this isn't the first time we've seen it reject them. Normally X2Pro is much more tolerant that FCP X. Same for me here, though I dropped it in a project on its own here and X2Pro converted that just fine. I'll continue to investigate. In terms of audition clips I've dug around in the timeline at the time listed and there is nothing showing up as an audition clip. However when I delete all the media in that area is moves past that error. Is there some work around for forcing a reference to the original media that can render some hidden audition clip. I tried the duplicate from original command on all the clips in that area and then finalized them but it was still throwing the same errors. It's give me an error on reimport also. • Unfinalized audition found at 00:35:56.12. Please finalize all auditions before exporting Final Cut XML. • Unfinalized audition found at 00:35:18.07. Please finalize all auditions before exporting Final Cut XML. • Unfinalized audition found at 00:35:29.38. Please finalize all auditions before exporting Final Cut XML. I was hoping to open the FCPXML in FCP X and find the auditions, but FCP X reports errors when importing it and fails to import it. Are you able to re-import it? I opened the FCPXML in TextEdit and I can see more than one audition listed. nruyle wrote: Understood but my thinking is that if that I have both these settings enables it would convert or move past the audio. Is this not the case? You are correct; that should work. The error message about "curtain bounce 4" is basically saying that X2Pro is unable to extract the audio from the clip with that name which is an MP3 file on a disk called "CURTAIN_PADDY" in the folder "CURTAIN/MUSIC/SkerrittBounces/"
Would you be able to upload that file to our FTP site so that we can take a look at it here? I can provide FTP details to the email address that you registered when you signed up to the forum. Last Edit: 4 years 4 months ago by nruyle. X2Pro does support extracting audio from MP3 files. What was the error message? You may have got an error message if you were trying to reference audio, and had X2Pro set to "Generate an error" when "handling media that can't be referenced". See www.x2pro.net/referencing-audio.html for more info on referencing media and associated options/limitations. Understood but my thinking is that if that I have both these settings enables it would convert or move past the audio. Is this not the case? nruyle wrote: I am seeing tons of errors with this app. The first set of issues was related to non existent audition clips. 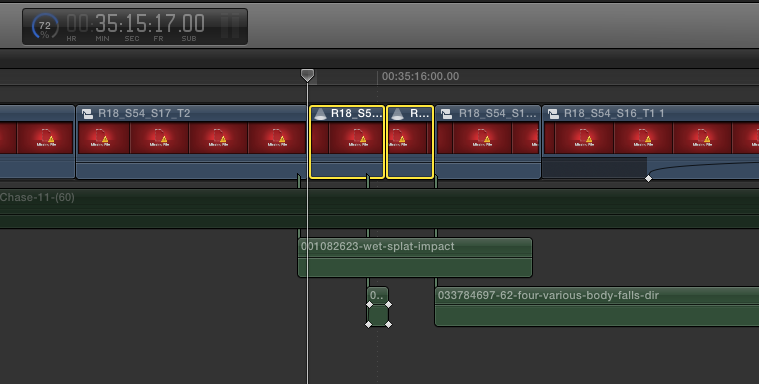 The only way i could get past that was to delete a full minute of footage and audio from the timeline. I guess I will be exporting that sectional manually. If you attach your FCPXML that causes this issue I can take a look at it. nruyle wrote: Second issue is that it would not export an MP3 file so I deleted that. X2Pro does support extracting audio from MP3 files. What was the error message? You may have got an error message if you were trying to reference audio, and had X2Pro set to "Generate an error" when "handling media that can't be referenced". See http://www.x2pro.net/referencing-audio.html for more info on referencing media and associated options/limitations. nruyle wrote: This is hands down the worst export experience I have ever had in an app and I have done this for a long time in almost every editor. As a decision maker at an institution which could potentially purchase hundreds of these licenses, at this point I couldn't possible recommend this application. I'm sorry to hear that. Most users don't have any problems using X2Pro and we do receive a lot of positive feedback, but of course, it won't always go smoothly for everyone. Hopefully we can get you up and running quickly when we have the FCPXMLs to look at. Last Edit: 4 years 4 months ago by Graeme Robinson. I am seeing tons of errors with this app. The first set of issues was related to non existent audition clips. 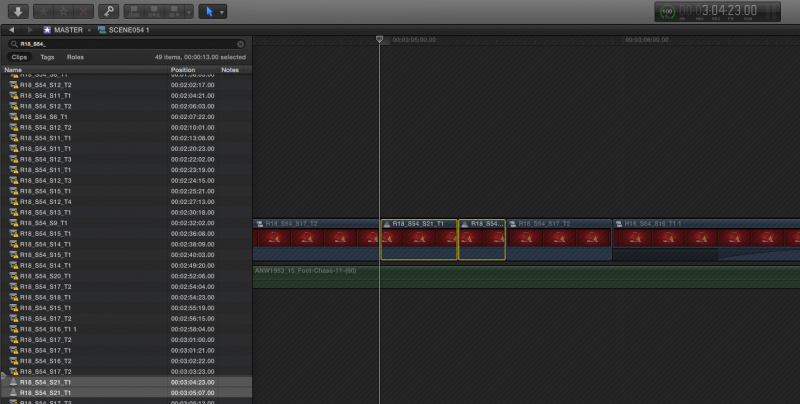 The only way i could get past that was to delete a full minute of footage and audio from the timeline. I guess I will be exporting that sectional manually. Second issue is that it would not export an MP3 file so I deleted that. This is hands down the worst export experience I have ever had in an app and I have done this for a long time in almost every editor. As a decision maker at an institution which could potentially purchase hundreds of these licenses, at this point I couldn't possible recommend this application.